Jefferson Early Learning Centeris home of Pauls Valley School District's youngest citizens, our Pre-Kindergarten and Kindergarten students. Pauls Valley is a community committed to the educational excellence for all children. The Jefferson ELC staff provides a nurturing environment for each child and their families with our philosophy encompassing child-centered and family focused learning. Through a cooperative partnership between the Jefferson ELC staff and each child's family, natural curiosity and enthusiasm for learning will continue to grow. On behalf of the faculty and staff I would like to extend an invitation for you to visit our school often. As partners, it is imperative we have your input, interaction and involvement in all areas of your child's education. Shared cooperation and expectations between home and school will play a valid role in your child's growth. All children can learn, but not necessarily at the same rate and time. All children have a natural curiosity and enthusiasm for learning. Children learn from each other. Children learn from adult models. Children learn best when they are doing. Children will learn when they are happy and comfortable. Children become self-directed learners and take responsibility for their learning. Pauls Valley Junior High and High School students participate in numerous clubs and organizations that are actively involved in improving the school and community. 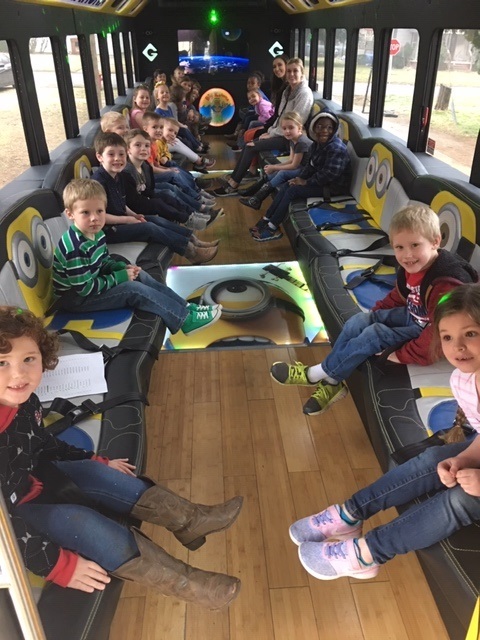 The students that sold 15+ items on the last fundraiser were treated to a ride on the Big Kahuna Bus and lunch at Mazzio's. The Jefferson Early Learning Center staff will recognize and appreciate each child's uniqueness. We will work together to provide our students with a nurturing and positive climate for learning and success. I am a Jefferson Early Learning Center student. I have the courage to be the best I can be. What I will do in the tomorrows of my life.